Fans of Jamie’s home cooked Italian cuisine at Vivo City may rejoice as the second outlet at The Forum is now ready for business and they are dishing out popular favourites with a twist! Stepping into the restaurant, we were greeted by the friendly staff and swiftly ushered to our seats. The ambience was captivating from the decorations – cloves of garlic and dried chili hung around the kitchen, to an open view of a busy chef tossing pizza dough, it gave us a sense of returning home to a warm Italian family’s abode.This 129-seater restaurant features London Underground-­style tiles and an eclectic mix of reclaimed church chairs and upholstered armchairs. 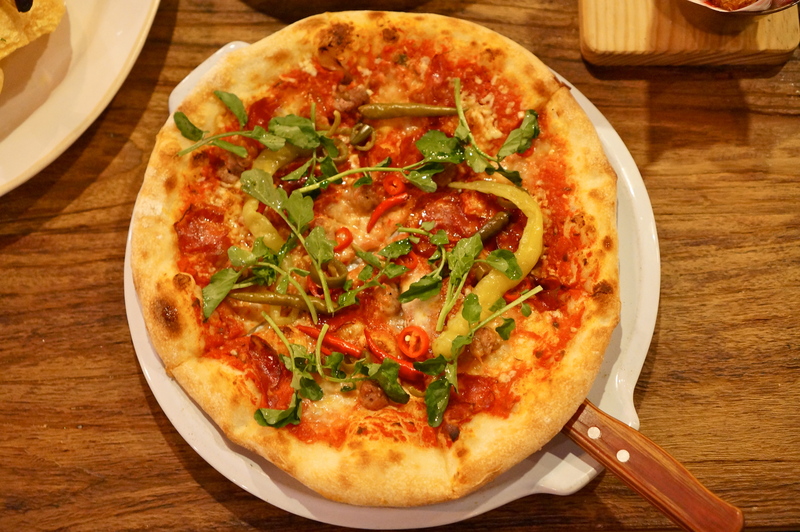 Jamie’s Italian @ Forum will showcase a smaller, curated menu of Jamie’s Italian favourites alongside a mouth-watering selection of hand-made artisan pizzas! Morning coffee and sweet Italian artisan pastries will also be served as early as 10 am every day. 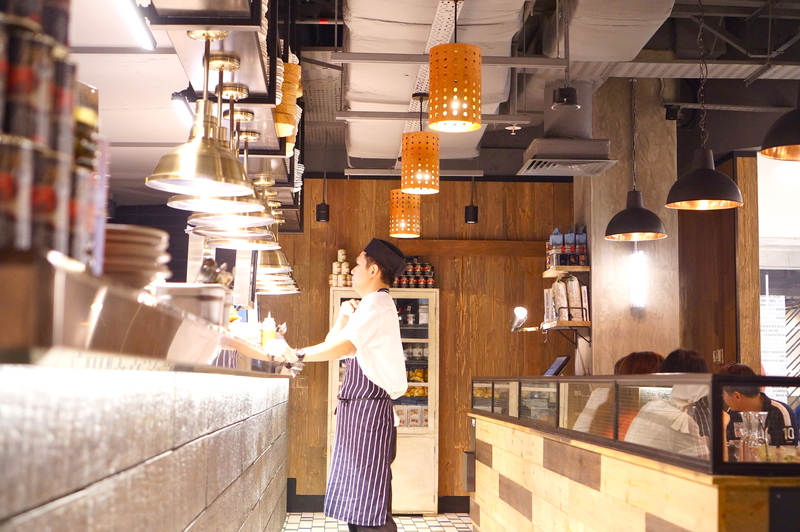 Whether it is day or night, the restaurant transitions seamlessly, making it the ideal place for that early morning pit stop, leisurely lunch or dinner, social drinks and nibbles. Spot the pizza chef gently hand-­stretching the pizza dough, baked to order. Pizza dough lovingly made by hand is definitely the key to an irresistibly crisp base! Pasta will be made daily on-site too, woohoo! 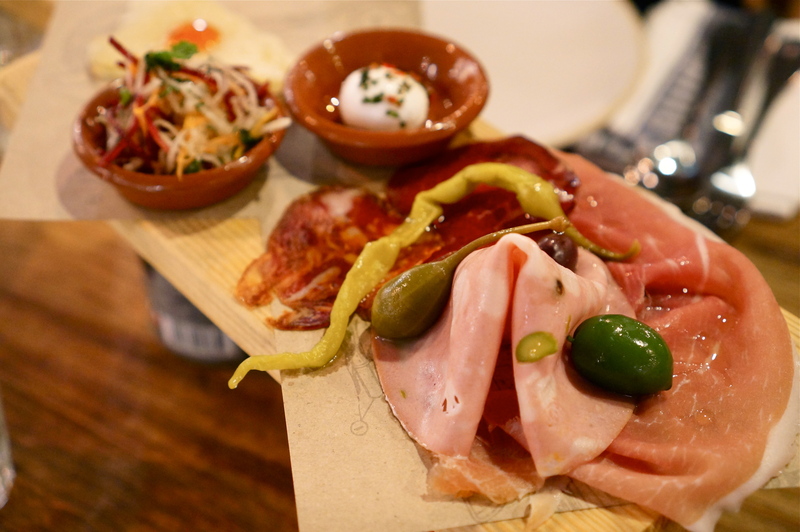 Cured Meat Plank ($16.50) – The cured meat plank consists of four types of meat -San Daniele Prosclutto, Hot Soppressata, Mortadella and Bresaola. Accompanying the meat was a wonderful mix of mini buffalo mozzarella, pecorino, chili jam, pickles, olives and crunchy salad that gave the dish an amazing array of flavours. This dish served as an excellent appetizer that was not too heavy due to the paper thin slices of meat yet the clever pairing of savoury and sweet ingredients paved the way for my gastronomic journey with Jamie’s. Cauliflower Fritti ($13.50) – Bite-sized, fried to a perfect golden brown and drizzled with grated parmesan, chopped parsley and lemon zest. These deep fried cauliflower and parmesan balls are bursting with flavour but each dip into that irresistable arrabbiata sauce made me craved for more! However, the arrabbiata sauce was leaning more towards the sweet side and Singaporeans would have appreciated a sauce with more punch such as chili padi. 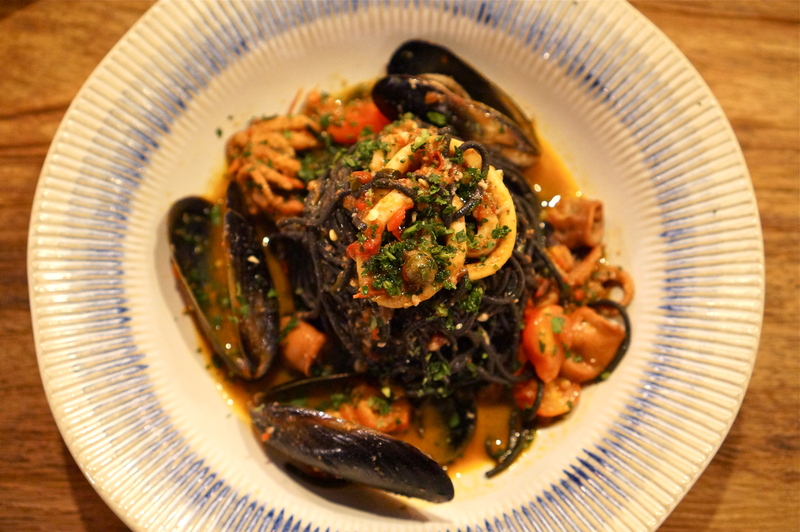 Octopus and Mussel Spaghetti ($17.50/$25.50) – This dish consists of three parts: braised octopus, flash fried squid and mussels and squid ink pasta. Octopus is braised with garlic, chilli, cherry tomatoes, parsley, white wine, capers and anchovies and cooked for 75 minutes. This was definitely one of the better pastas I’ve had in Singapore! Distinctively handmade, the spagehetti had a unique bite to it. Instead of pureed tomato as its pasta sauce, the gravy had a desirable taste of seafood essence to it, paired with some kick from the chilli. Too awesome! 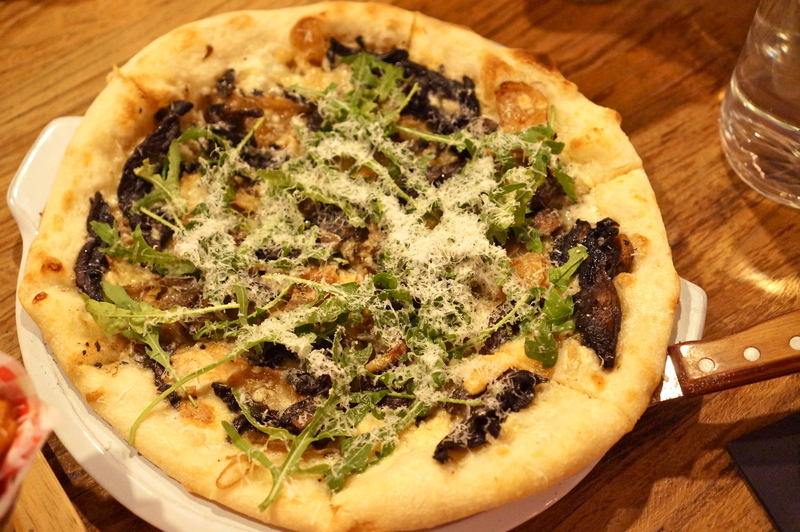 Funghi Pizza [White pizza with cheesy béchamel, truffle cream, truffle butter, smoked mozzarella, porcini and peppery rocket] ($23.50) – Indeed, the dough was kneaded to a perfect thickness, and most importantly, had complemented the goodness of the toppings. My favourite dish of the night, this flavour had topped all pizza flavours that I’ve known of. The hint of truffle was subtle and the cheese over the soft dough was simply amazing. Notice how the edges are not burnt? That’s how a good pizza should be. Italian Hot Pizza [Rolled meatballs, buffalo mozzarella, chilli padi and pickled chillies] ($24.50) – True to what I’ve said earlier, no other flavours can top the Funghi Pizza. However, if you’re feeling more conservative, this a fool-proof one. 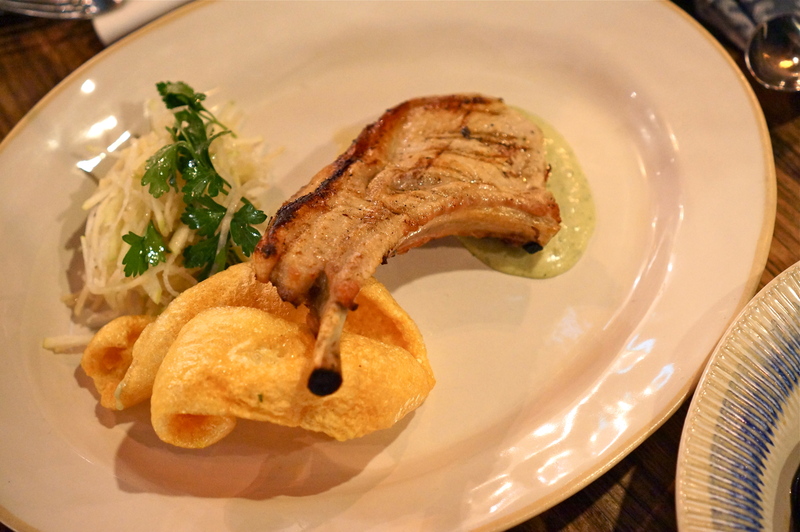 Grilled Pork Chop ($38) – Apart from pastas and pizzas, Jamie’s Italian has some really good mains too! The pork chops are brined for 24 hours before cooking in al mattone style, a Tuscan method of grilling meat under a brick which pushes the meat further against the grates of the grill, allowing it to develop a smoky, juicy and flavourful result. This is served with pork crackling! Not the cheapest pork chops in town, but it must be one of the tastiest ones! Visually, the pork looks tough and dry. However, once you sink that huge knife down, you’ll feel the difference before even tasting it. Epic Brownie ($12.50) – I lava youuuu… This, this is very epic! You know why? This is one brownie that actually FLOWS like lava. Mind-blowing I tell you. 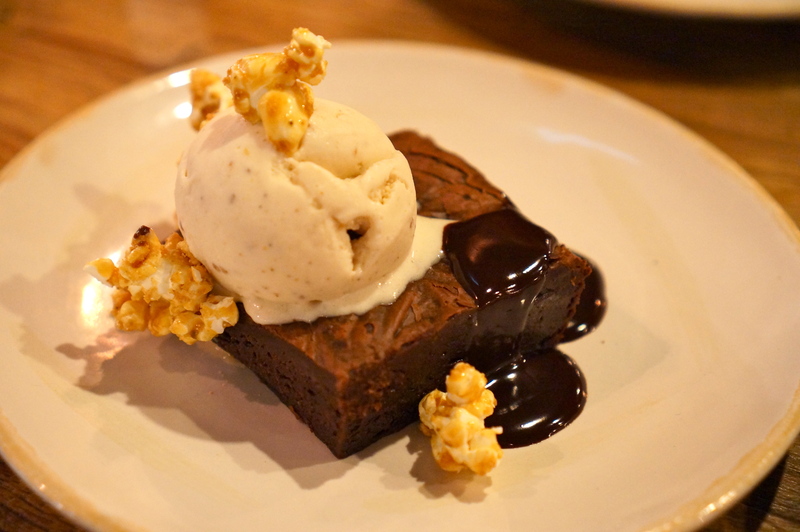 A must-order for all choc lovers and that salted caramel popcorn provided a contrasting flavour to the sweet, dark brownie, it’s genius! 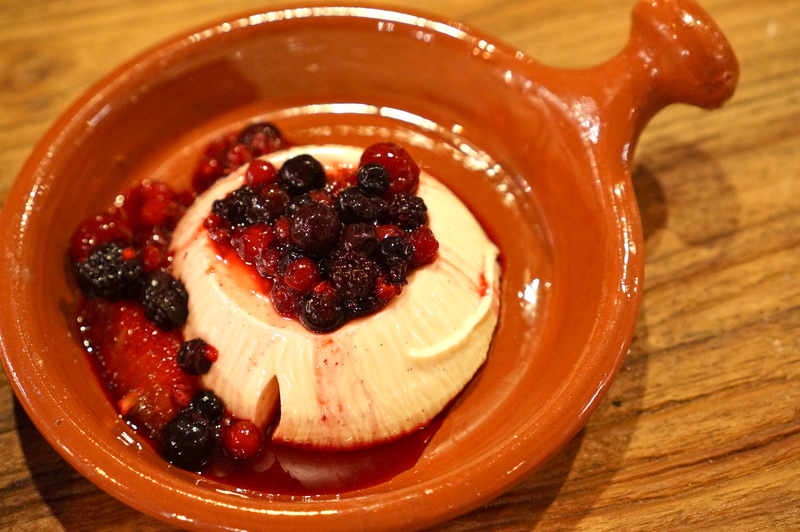 Creamy Panna Cotta ($10.50) – The signature dessert here and the only panna cotta I know that actually wobbles when you move it, I’ve sung praises of it the first time I had it 2 years ago and nothing has changed. Super jello! It’s so light on the palate and melts in the mouth perfectly. A generous serving of seasoned berries don’t hurt either! Lemon Meringue Cheesecake ($12.50) – Such a pretty sight! The airy meringue piled up real high on the cheesecake – it makes me wonder the amount of sugar I’m taking. :O Diets aside, the lemoney cheesecake was surprisingly light (unlike those American cheesecakes) and its crust was make will make Jamie’s granny proud. Tiramisu Martini ($19) – Wow. Do order this if you’re skipping desserts. Well, even if you aren’t, you deserve a treat to this wonderful liquid tiramisu! The drink captures all the elements found in tiramisu, with a stronger alcohol kick! Not for the faint-hearted! Jamie’s Italian Mojito [Bacardi Superior rum, Martini Bianco, fresh mint, lime & sugar, topped with Prosecco] ($18) – I started off with this bubbly cocktail and I loved the overload of mint. Refresher [Fresh lemon juice, elderflower cordial & cranberry juice, topped with lemonade] ($7.50) – A fruity punch that is great for even the kiddos! I’m really impressed and the new menu here at Forum. 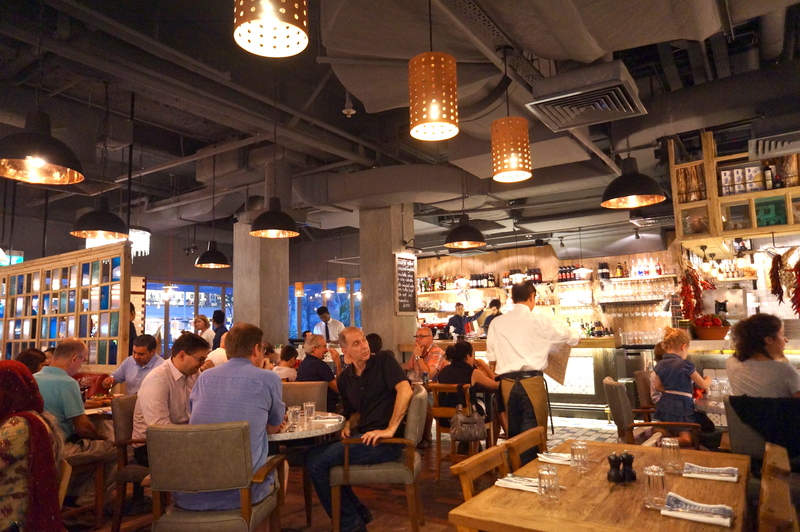 It’s largely different from the one at Vivocity and after his debut in Singapore 2 years ago, Jamie has definitely fine-tuned the flavours to suit the Singaporean palate. I love how hearty the dishes here are – every plate is great for sharing! 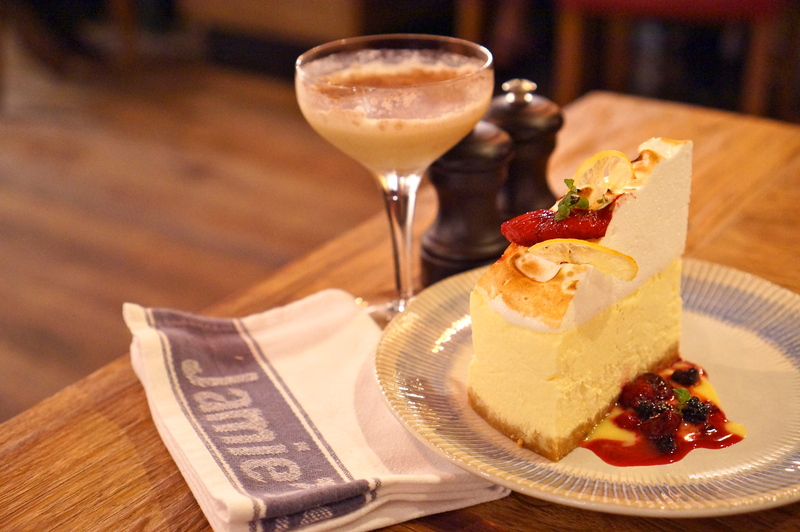 The rustic feel of each dish testifies the unpretentiousness of the food at Jamie’s Italian. 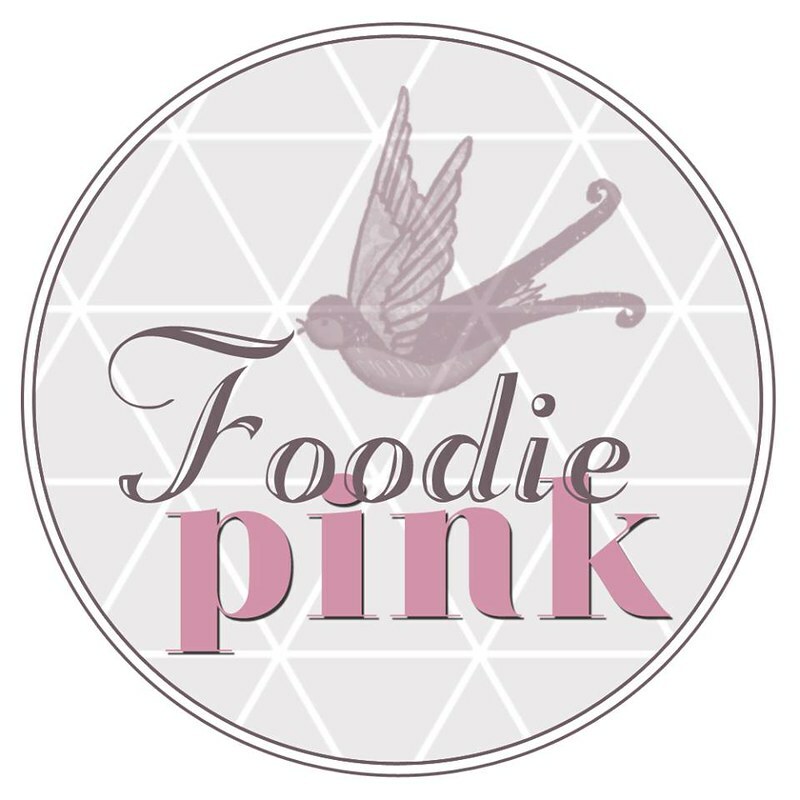 Lovely, lovely new addition to our local F&B scene. Many thanks to Ada for hosting us!